This miniature fiber optic Variable Optical Attenuator (VOA) is based on an electrostatic MEMS mirror. 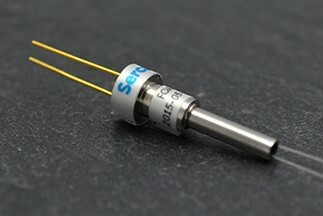 A voltage between 0 V and 6.5 V on the drive pin sets the optical attenuation. When power is removed, the VOA returns into its default state. There are two variants available with different default states: the normally open (bright) type or high attenuation (dark) type. The dark variant has better linearity and is used in applications where the light is cut at power off. The MEMS component is hermetically sealed. The part is designed to conform to Telcordia 1221 reliability standards. No epoxy is present in the optical path. The optical collimator is assembled using laser welding techniques which results in long term stability and excellent reliability. The component withstands rugged environments. It can directly be mounted on printed circuit boards. The coaxial type VOA is non latching and returns to the default position at power-off, i.e. the bright variant returns to the minimum insertion loss position, whereas the dark variant returns to the high attenuation state (blocking the light at power off). Maintaining fibers are available. The component is compliant to ROHS requirements 2011/65/EU.